Now this isn’t guaranteed for every series I read, but a good deal of the time I like the second book even more than the first. Unfortunately, this was not the case. But don’t get me wrong, I still loved this book, just slightly less than Unearthly. And the sole reason for that will be explained in a bit. First I want to talk about what I did like. First of all, WOW. I did not expect the story to take the turns it did. I still don’t know how this will affect the story going into book three. Let me just say that unless your heart is made of ice, this book will make you cry. But before that it’ll tease you with what it wants you to think before saying NOPE! This is what really happens. Ah well. Because of this event new characters were introduced, one of which I really enjoyed and think will be a good presence in Clara and Jeffrey’s life. I was also pleased to learn the reason behind the way Jeffrey was acting in the end of Unearthly and most of Hallowed. I very much hope to see more of him and his part of the story. Now to the part I didn’t like. Lack of Tucker! 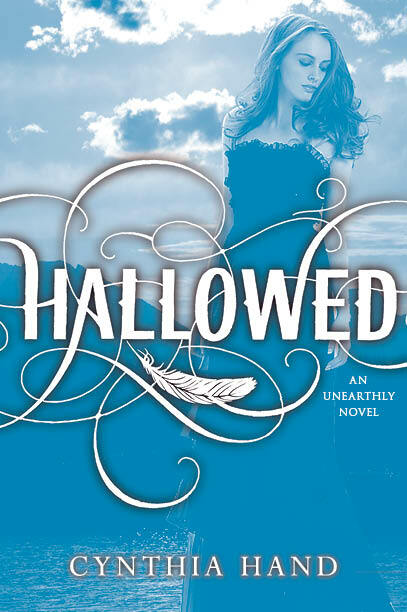 He snuck his way into my heart in Unearthly, but I felt as if he was just pushed aside in Hallowed. An after thought. I’ll admit it was kind of nice seeing more of Christian and getting to know him better than we did in Unearthly, but I am firmly team Tucker. I hope this is rectified in the next book. I also liked that while Samjeeza made a return, there wasn’t really a lot of action in the good guys vs villain department. Some possible build-up, but besides one incident that further pushes Tucker away, there wasn’t anything like the big fire and fighting the bad guy. Just a lot of research, done mostly by Angela. All in all, it was almost right up there with Unearthly, nearly even. This series is definitely my favorite angel series out there, especially since it focuses mainly on the angels themselves, and not necessarily God and religion. I know that in reality you can’t have one without the other, but this is fiction so anything goes! I loved Hallowed! But I completely agree with you, I also loved the first one just a little bit more. I was not expecting half of the things in the book. Can’t wait to see what happens in the third one! I wanted to read this one so badly as an Earc. But didn’t get my request approved from NG. Now I’m stuck waiting unitl Jan. 2012. That’s a long time. I’m happy to see you liked this one. NO TUCKER? or little mention of him? That’s a let down. He was my fav! @ Kristina – I know right? Especially with the mom! @ Gina – Tucker is in there, just definitely not as much as I wanted him. There was more of a focus on Christian.